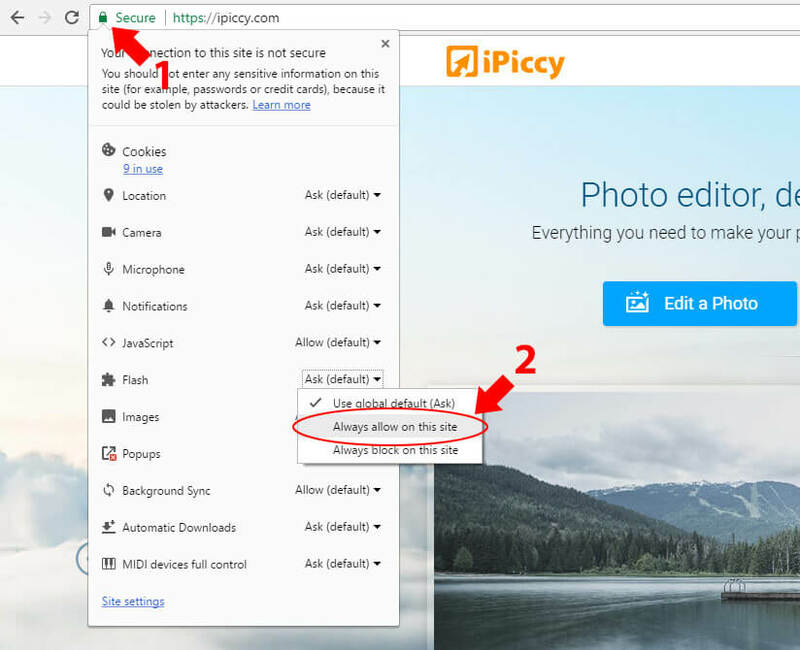 Google Chrome is a great browser for Flash apps but if you’re getting Flash error messages while using iPiccy, here are a few things you should investigate. The Chrome browser comes with its own Flash player, so updating Chrome will often take care of any problems. 2. At the top right, click the three vertical dots, also known as the “more” button. 3. Click Update Google Chrome. If you don’t see this button, you’ve got the latest version. 1. Click the padlock icon (or circle with "i") on the left side of Chrome’s address bar. 4. Click anywhere outside of the drop-down list to dismiss it. Click the Reload button on the notification bar. 1. Type “chrome://settings/content” into Chrome’s address bar, and hit enter/return on your keyboard. If you are still experiencing problems, reset Chrome. This will return your configuration to the default state and help eliminate conflicts with extensions and plugins you may have installed. 1. Type “chrome://settings” into Chrome’s address bar, and press enter/return on your keyboard. 3. Scroll all the way down and click Reset Settings, then click Reset to confirm.